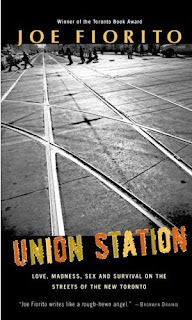 In Chapter 16 Joe Fiorito investigates the stories of transit. In other words the stories of the people and/or the events that happen while on pulblic of transit. -Need a seat on any train line going through 14th Street-Union Square? Stand in front of someone with a backback, they will most likely be NYU students and will be leaving the train at this stop. -Pigeons ride the subway out in the Rockaways. The pigeons board the subway cars looking for food while the trains wait to head in the opposite direction at the end of the line. Once the train is ready to start again, the doors close and the pigeons are still on the train! -the broken sea shells seen on the bridge from the mainland to the Rockaways on the "A" line are from sea gulls and other sea faring birds scooping sea shelled creatures and then smashing them on the concrete bridge abutments in search of food. Of course, some people blog about the subway like SUBWAYblogger and Steve Munro. These writers take a look at both what is going on the subway from their point of view as well as the politics that involve the governing transit agencies. Others do blog about the subway as well. I just Googled the word "subway" and came up with 675,495 results in just a blog section only. Everything from transit delays to meeting someone on the subway came up. Of course I have my own stories of public transit. Just search "York Region Transit" or "YRT" in the blog search above to see what terror I've been put through as well as my views of the current system of public transit in York Region. - You can buy almost anything on the New York City Subway system. Just don't expect any warranties! - I've moved apartments accross Brooklyn on the subway during my time in New York. - The subway is a great place to see what people are reading. People read everything from the Bible, the newspaper, maps, a wide variety of literature, etc. on the subway. Looking for a good book? Check out the interesting titles on the subway. Sure these aren't that interesting stories, but there are several sources on the web (i.e. Google subway in the blog search section) and in print that provide good reading. Fiorito, sadly on provides one decent chapter. Update! : The New York Sun takes a look at what people are posting about the New York City Subway system by way of popular Subway Blogs. Read the article here.